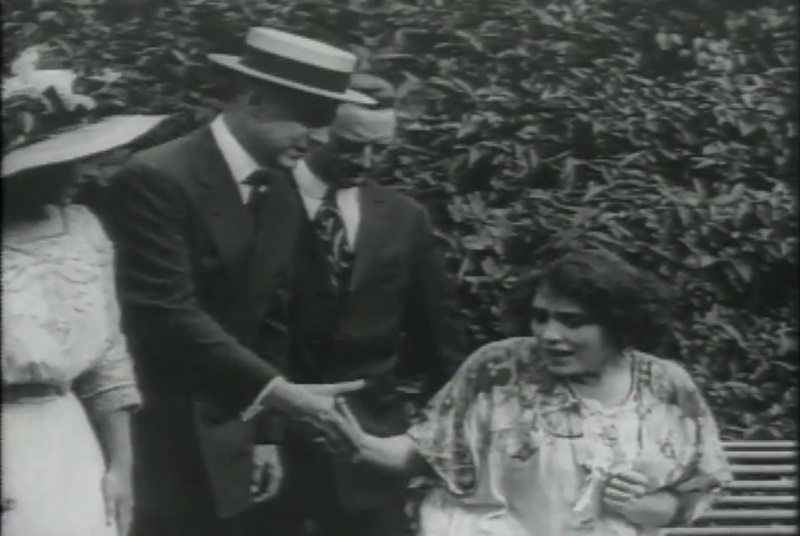 This short from Thanhouser features its major star, Florence LaBadie, only in a supporting role, but makes use of locations to free up the cinematography somewhat. It’s the story of a typical love-triangle and the rivalry that it calls into being. The movie opens with the death of a loving father, who puts his daughter (Jean Darnell) into the care of his best friend (Henry Benham) upon his death bed. The friend puts the “orphan” (as she’s known throughout the movie) up with his mother, presumably because it would be unseemly for a bachelor to live with a young woman. She nevertheless falls for him, and swoons visibly when he gives her a small flower from the garden. Then, some “friends from the city” come to visit the mother. One of them is Florence LaBadie, who immediately captures Henry’s attentions, resulting in dark sulks from the orphan. 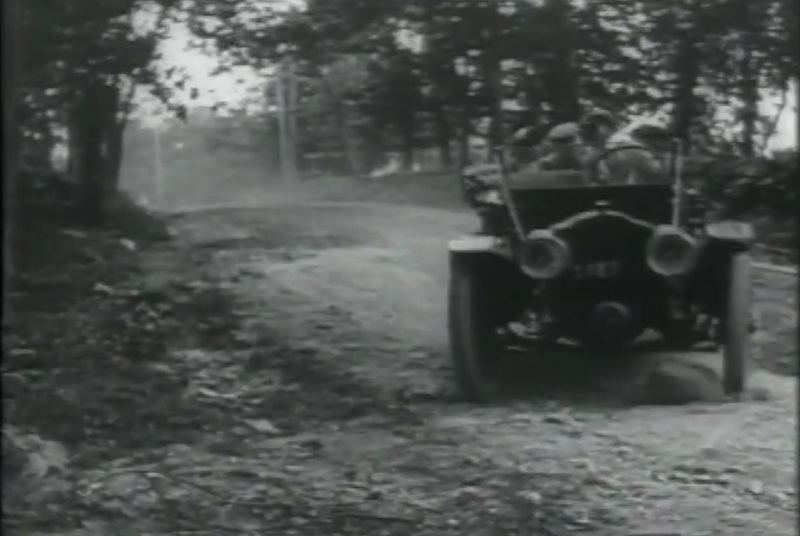 The three go out driving together, and the driver manages to hit a tiny rock and come to an immediate halt, which somehow knocks out the two women (perhaps because of their delicate constitutions, cough). They are rushed to the hospital and given a “powerful heart stimulant.” Jean then has the clever idea of pouring an overdose into her rival’s medicine, but the doctor sees her through the window (which he apparently routinely peers through to spy on female patients). He prevents the OD, but allows the orphan to believe she has killed Florence. Now, wracked with guilt, the orphan begins to have visions of the dead girl haunting her. After allowing this to go on for a month, the doctor finally shows her that Florence is fine. Jean is repentant, and all is fine. Watch out for that HUGE ROCK!!! I think this movie could have been a lot better if Florence had played the orphan. Jean Darnell overacts painfully, particularly when she’s writhing around in bed over her guilty conscience, but really at pretty much any chance she gets. Florence mostly looks on embarrassed, although she manages to display some real chemistry with Henry on the car ride. Admittedly, the premise was silly and likely to call for overly emotional performances, but I think Florence might have saved it, given the chance. As it is, I spent more time appreciating the outdoor locations, reportedly in New Rochelle, New York, and the occasional tilts of camera to keep the players in frame. The shot through the window was an interesting choice – we just see Darnell’s arms as she puts the poison in, the curtains drawn so that we don’t see her face or body. The special effect of the transparent ghostly Florence was pretty typical for 1912. The copy Thanhouser has put up on vimeo includes a nice organ score by Ben Model.